Peter started training in Karate under Bob Davies with Torbay Karate Club at the end of 1973.Peter has also trained under Sensei Enoeda, Tomita, Ohta, Kawasoe, Shirai, Sherry and other top British instructors, including the late Steve Cattle.He assisted Bob Davis with instruction, mainly in Dartmouth and took over the running of the club in its own right.Having struggled with long-term medical problems, never the less he was able to pass his Shodan with Sensei Enoeda.Peter continues instructing, enjoying passing on his knowledge and enthusiasm of Karate. Kain started training at the age of 12 in the autumn of 1986 at Dartmouth Shotokan Club under the instruction of Sensei Peter Atkins. He passed his first grading in March of 1987 under Sensei Steve Cattle. He carried on training and grading until he reached 3rd Kyu (Brown Belt) in 1989. He stopped training due to work commitments and moving away and had a gap of nearly 20 years until he resumed training at the club with his son. He passed his Shodan (1st Dan) Black Belt in April 2010 and then Nidan (2nd Dan) in July 2012. Both these Black Belt gradings were taken under Sensei Andy Sherry (9th Dan). Kain also achieved his 3rd Dan in Sept 2015 under instruction from Sensei’s Sherry, Pointon & Brennan at the University of Bath. Kain continues to train and teach which he enjoys doing and hopes to keep passing his knowledge to new students and progressing up the grades. Chris started training at Dartmouth Karate Club as a school boy in 1993 taking his first grading with Terry O’Neill in 1994.Chris graded regularly up to 4th Kyu (purple/white belt) in 1995. After this point he took a break from Karate for 10 years or so and returned to Karate in 2005.After 6 months of training, he started grading again and acquired his Black Belt (1st Dan) in 2011.Chris enjoys teaching his skills and knowledge of his time in Karate and looks forward to supporting any new members who join the club. Richard started training in 1983 and is an instructor with the club. He trained with the Japanese instructors Enoeda, Tomita & Ohta along with Sensei Sherry & other top KUGB instructors. He had a break from Karate for 2 years and resumed training at the Dartmouth Karate Club in 1990. He gained Shodan in March 2002 under master Enoeda (9th Dan) and his Nidan in April 2013 with Sensei Sherry. 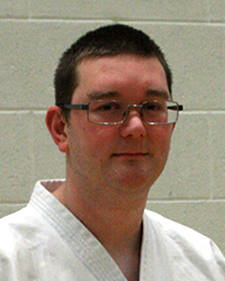 (9th Dan) Having qualified as a KUGB instructor in 2005, Richard is keen to help all new students and pass on his knowledge of Shotokan Karate.